PAUL JAY, SENIOR EDITOR, TRNN: Welcome back to The Real News Network. I’m Paul Jay in Washington. And joining us again is Josh Stieber. He was a member of the Army company that was in that famous WikiLeaks video in 2007. He wasn’t there that day, but his comrades were. Thanks for joining us again, Josh. JAY: So why don’t we pick up from the last. You had more or less refused to stop firing your gun [sic] because you were being asked to fire at civilians, and so you got assigned to be on radio detail with one of the officers. So talk about that. And how does that lead you on your journey towards applying for conscientious objector status? STIEBER: Well, with the job of being on the radio, I got to see more of the behind-the-scenes stuff going on. So I would be in meetings with the different officers and with local officials. And one thing that was really huge for me was was one of the people that we met with regularly, who was the mayor of the district that we were living in, an interesting thing about that was how we established our relationship with him. We actually arrested him one night when we found out that he had been involved in some attacks against us, and we were all set to send him off to jail, until we found out that he was the mayor. So instead of sending him to jail we started negotiating with him. And here I had been, you know, hearing all these things, from as high up as the president, saying we will not negotiate with terrorists. And for me at the time, that epitomized strength that, you know, I have the right answers—why would I take the time to sit down and talk with somebody that disagrees with me? And weakness was negotiation, because if I’m right, then I shouldn’t need to depend on somebody else for help. But I was seeing that my definition of strength was hurting people; and here is my definition of weakness, of negotiating with people who are my enemies, starting to create some progress. We would make deals and say things like we’ll give you school supplies or medical supplies if you tell your guys not to blow us up for a certain amount of time. And violence went down, and supplies get distributed. JAY: And were these Shia? Sunni? Or did it make any difference? STIEBER: I believe it was Shia, but I’m not 100 percent positive. JAY: So you don’t know which insurgent, quote-unquote, "insurgent forces" that he was connected to. STIEBER: We got very little training or information as far as the cultural situation went. JAY: Yeah, what did you know a who you were fighting? STIEBER: We knew that the primary force in the area was the Jaish al-Mahdi, who was under the control of Muqtada al-Sadr. So people recognized his name. But to pretty much get any kind of idea of what was going on culturally, you had to talk to the interpreters. JAY: Right. So these are Shia Sadrist forces, which are mostly, if I understand correctly, mostly poor people. STIEBER: Yeah. Yeah, it was a pretty impoverished part of town. JAY: So what do you start to hear then, other than the negotiations, that starts to make you further question what’s going on? STIEBER: Well, as I saw my definition of strength begin to hurt people and my definition of weakness begin to create progress, for a while I didn’t know what definitions to have or didn’t know what to think. And then I guess another very telling moment that really forced me to take all this confusion I had and really ask myself the difficult questions that I didn’t want to ask was one night when—. [snip] One night, a friend of mine that I had gone to church with before we deployed—and, again, religion played a pretty important role in my life. So I’d gone to church with this guy, and we’re sitting there one night guarding a prisoner that we’d been assigned to watch over, and my friend started saying some threatening things about what he wants to do to this prisoner. And, again, I’d been sorting through all these different ideas of who I was. I was an American, I was a Christian—all these different things. And so my first thought was this American ideal that I had grown up hearing, and I asked him about it, and I said, "Isn’t this man innocent until proven guilty?" Alright. So my friend and I are guarding this prisoner, and my friend, who I had gone to church with before I deployed, started saying some threatening things about what he wanted to do to this guy. And I had been, you know, thinking through all those ideas of who I was as an American or as a Christian and just trying to find my identity. So I started to ask him this ideal that I connected with my American identity, that isn’t this man innocent until he’s proven guilty? And my friend said, echoing the racism that we’re trained with, well, this man’s Iraqi; there’s no way he’s completely innocent; surely he’s contributed to the problem in some way; so I want take out my frustration on him. And then I started thinking about all the things that we had heard sitting next to each other in church and said, well, you know, what about these direct quotes from the man that supposedly our religion is founded on, of loving your enemy and returning evil with good and turning the other cheek? And my friend said to me, very sincerely, I think, he said, you know, I think Jesus would have turned his cheek once or twice, but he wouldn’t have let anybody punk him around. And as I heard him say that, it sounded really ridiculous, but then I thought about it a little further and I started to realize that what I was doing through my actions and the things I was putting my faith in was pretty much that exact same mindset. I just had a lot fancier terms to attach to it. And when I started to think about it and how bluntly my friend had put it, he was right, that here I was saying that, you know, I was putting self-defense or putting national security at the top of my priority list, which—you know, that can—that’s something you can legitimately debate. But if you try and connect that to a man who died on a cross trying to practice love, rather than defend himself and not go through that, you know, horrible suffering that he did, then those are two separate things, and I don’t think they have a lot of common ground, so that really, when I heard him say it that way, really started to make me think, you know, which one am I going to follow? Because I don’t think it can be a combination. JAY: And is there anyone you can talk to about this? And do you? STIEBER: There was one friend I had who would listen to me and we would have a lot of good conversations. JAY: What about army chaplains or priests? I mean, they’re actually there, in a sense, to bless the union of the nationalism and the religion, or they wouldn’t be there. JAY: But were you able to talk to them about these questions? STIEBER: I didn’t see any value in talking to our chaplains, ’cause he, you know, would, yeah, say why God was blessing what we were doing, and said some ridiculous stuff like that we should be interpreting everything that’s going on, or the perspective we should have on our experience in Iraq, is think of it like summer camp, and just stuff that he didn’t seem to have much connection with what was going on. JAY: And at what point do you think back to that book The Faith of George Bush and start to wonder whether that’s a faith you want to be part of? STIEBER: It’s still a faith that I guess I want to be part of, but not in those terms. Again, that I feel like, you know, George Bush might have felt like he was justified to do what he did. You know, the more I study, the harder that is for me to reconcile. But giving him the benefit of the doubt, even if I say that, you know, everything he said and did was completely justifiable in terms of national security—still doesn’t match up with, you know, the way that Jesus lived his life. And so I can either choose to have faith in someone like George Bush or a political leader trying to, you know, defend his country or whatever he’s trying to do, or I can have faith that, you know, if it comes down to it, that sometimes practicing love might mean that you don’t make it through alive, and that I’d rather go down living with that love then go down in—put in situations where, like this video, where you might be harming, you know, innocent children in the process. JAY: So do you write home? Do you talk on the phone to your parents? Your parents are quite religious. So do you start to come out with your questioning? STIEBER: Yeah, I would start to write home about, like, contradictions of the things that I saw, or say that, you know, I think we need to look beyond just the flag and say that the flag or whatever America puts its stamp of approval on, that that doesn’t necessarily make it good, or even if it’s good in terms of self-defense or whatever value that is, that maybe that’s not the same as carrying out our religion. JAY: And how did your parents respond? I mean, Americanism is part of the religion. STIEBER: Yeah, it didn’t go over so well. And kind of the mindset it seemed that they would have or that other people I would talk to had. And I didn’t get very into the different details specifically of what was going on, what I was seeing on a day-to-day basis. It was more of the theories, you know, which I think should be enough. But the mindset that I would get from them and from other people was, you know, you’re in this really intense situation and, you know, you’re not able to reconcile everything, or maybe you should wait to try and figure out these huge philosophical questions and just do what it takes to make it home alive. JAY: Did the officers you were reporting to have any idea about what was going on inside your head and heart? STIEBER: They knew, I think, that I was starting to question things more and more and to feel less and less idealistic about the things that we were doing. JAY: And how do you think they dealt with the same questions? ‘Cause they came up with a lot of the same kind of training and education you did. And why do you think this kind of made such impact with you and they kept soldiering on? STIEBER: I mean, I think the big thing was that, like I said before, that they were questioning what we were doing, but it became about this mindset of fighting to make it home alive, which I’m not going to judge someone for taking that mindset, but, you know, I had to ask myself some very serious questions, you know, of what’s justifiable. And I think a lot of people think that different things, like human beings are naturally violent, or war is always going to exist, or these other very underlying philosophical beliefs that affect how they act. And if you think that war’s always going to exist or that, you know, you need to use violence to stand up for yourself, you might, you know, even have problems with a particular situation but then justify it in terms that, you know, this is just the way the world works. JAY: Well, in the next segment of our interview, let’s talk about the day you decided to apply for conscientious objector status. 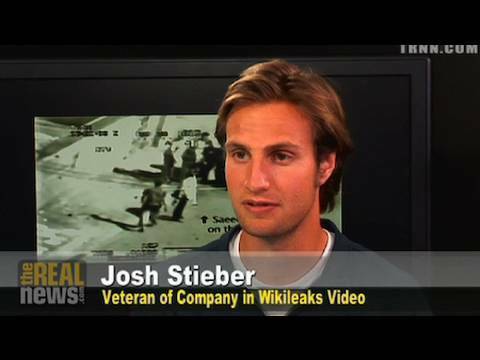 Please join us for the next segment of our interview with Josh Stieber on The Real News Network.